Megan Westphal, assistant range biologist for the Nature Conservancy of Canada’s (NCC’s) Manitoba Region, has come a long way from picking raspberries and building forts with her cousins on their grandparent’s farm while growing up. 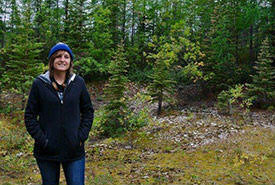 Megan studied plant biology and physiology at the University of Winnipeg. She then continued her academic career at the University of Manitoba in the soil science department, where she recently completed a master’s of science degree in soil ecology, with a thesis on monitoring greenhouse gases. MW: My first job in the environmental field was at the soil science department at the University of Manitoba. It was heavily agriculture-focused, but it has helped me understand the strong need for a connection between conservation and agriculture to provide food sustainably for our growing population. MW: A typical day at NCC for me changes depending on the season. During field season (late spring until early fall), a typical day would consist of prepping assessment sheets and planning the property to be surveyed. This can be really exciting, especially planning and discussing with other NCC staff about species you could potentially find on the property. While in the field, we will use GIS to survey the area for species and changes in the landscape and compile the notes taken during the day. During the winter, our days consist of mapping the areas that were surveyed during field season as well as report writing, but also regaling each other with tales of last season’s field days. RB: Tell me about a time you consider to be your “best moment in science.” This could be a moment when you discovered something in nature, a moment when you saw a species or something you learned about yourself. MW: My best moment in science would have to be during the 2016 field season, working at the Ellice Archie Community pasture, when I found a soil profile with freshwater seep coming out at the top of a valley. All my knowledge of soil classification came rushing to my head. I began asking myself about the reddish-orange spots in the soil, which led me to wonder if it was a gleysol soil or some sort of iron-loving bacteria. Being able to share my knowledge of soils and soil processes has been pretty great. MW: It’s important for women to be in science because it’s important to have as many different perspectives as possible to fully understand all possible aspects of an issue, species or area in order to find the best solution. RB: What advice do you have for women looking to make a career in the science or, more specifically, the conservation field? MW: Don’t be afraid to speak up. If you have any ideas or opinions about a project, voice them. I still have trouble with this. Though they may not always be the best idea for the task at hand, your suggestions may help initiate other ideas to help solve the problem.